Time for some dance news from Shangai? Dance Theatre MD, Tampere Art Museum Moominvalley, Heikki Mäenpää & Moominvalley Orchestra, Moomin Characters Ltd and Moomin Friends Association with their co-operators brought an example of Finnish culture aimed for the whole family to Shanghai Expo. Music and dance pulled the vast Chinese audience into their whirl, even though Moomins were a new acquaintance for most spectators. A happy surprise waited for some families which had the opportunity to learn a birthday dance in the dance workshops and perform it to Moomintroll. The culture export project, produced as a part of Finland's culture programme in Shanghai Expo, got huge visibility in the programme of the Expo and also in Chinese Media. Crossmedia artwork's executive producer-scriptwriter Mr Heikki Mäenpää and choreographer Mr Samuli Roininen have a reason to be happy. Right after the first show of the dance theatre performance Dancing Moominvalley at Europe Square the production team received an invitation to perform their art in the World Leisure Expo in Hangzhou, China in autumn 2011. Very happy. And excited by all this. 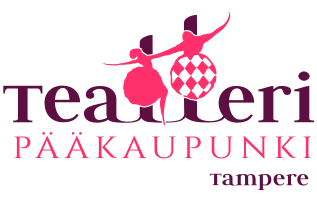 Remember also that the performances continue in Tampere at the Hällä Stage in September from Tuesday the 7th at10 following the Finnish tournee. Hyviä uutisia. Tanssiva Muumilaakso -esitykset jatkuvat taas pian Hällä -näyttämöllä!! Niin. No, sekin(...) Mutta tiesitkö, että Voima-lehti on alkanut julkaisemaan sarjakuvasivuillaan vanhoja Muumi-strippejä? "Voiman tulevissa numeroissa julkaistaan sarjakuvaa, jossa kaiken halutaan pysyvän ennallaan ja jossa poliisi on ystävä. Vallankumous, taide ja journalismi on pantu viralta. Kehitystä tai demokraattisia uudistuksia ei kaivat ja töissä ei tarvitse käydä. Silti jostain syystä eletään jatkuvassa yltäkylläisyydessä. Radikalismiin kyllästynyt silinterihattuinen perheenisä vaihtaa sanomalehden rakkausomaaneihin, koska minkään ei tarvitse muuttua." Voima-lehden ensimmäisessä Muumi-stripissä Neiti Sananvapaus esittelee Muumeille radikalismin alkeita kouluvaltauksesta poliittisen palopuheen pitoon. Paljon on muumeilla tietenkin vielä opittavaa. Ollaan vielä kovin "Alhaisella anarkian tasolla." Hanna Kuusela kirjoittaa Voimassa siitä kuinka vallankumous epäröimättä syö Muumilaaksossa lapsensa. Niinkö? Tässä se tarkoittaa Muumilaakson 'helppoutta' ja saavutettua 'tasapainoa'. On löydetty jotain, jota ei helpolla huojuteta. Onko Muumilaaksosta tullut Sveitsi? Tove on ehkä kokenut olevansa taiteilijana toivottoman porvarillinen. Taiteilijalla on vain oivaltavan ironian taju kuitenkin aina ollut suurempi kuin poliittisen palopuheen tarve. Toven tuotannossa on kyllä anarkiaa. Se saa lukijan miettimään, ja itse yrittämään pientä sabotaasia, vaikka sitten vain boikotoimaan omia tuttuja tottumuksiaan. On puhuttu ulos ja uudelleen oppimisen taidosta. Olisiko tämä sitä? "Muumit kun osaavat ivata muodin aallonharjoja ja korskeaa touhotusta. He kehoittavat pieniin seikkailuihin kohtuuden rajoissa ja muistuttavat modernien keksintöjen olevan usein huonompia kuin pussillinen esimodernismia. Rivien välissä kai sanotaan, että Muumilaakso on mahdollinen vain, jos kukaan - silinteripäiset herrat mukaan lukien - ei tavoittele liikoja tai turhia." Ensin on vain seikkailtava pikkuisen, jotta saa perspektiiviä ja sanottavalleen sisältöä. Vai? Ni hao. Yesterday we had the first full performance of the contemporary dance piece Dancing Moominvalley on the Europe square. And hooray, nobody fainted! Although the dancing in the furry costumes, as I was told, was truly sweaty and exhausting. Luckily for us, the sky was cloudy so the stage wasn’t so hot as we anticipated. Some thousand spectators gathered to see the show! Today we’ve already had the symposium called In Search of Synthesis. Sirke Happonen, Ph.D., who has made her thesis citation on the image, word and movement in Tove Jansson’s work, held a lecture about the illustrations and the dance in them. The lecture was followed by Sophia Jansson’s, Tove’s niece‘s memories of her aunt, who really loved to dance even on rocky cliffs on a Haru island and without any music. The whole artistic group then gathered to discuss the different perspectives on the subject. Samuli, the choreographer, told how he started to sketch the characters and their own typical way to move. 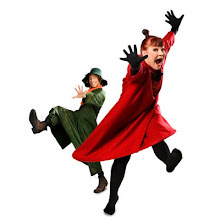 We learned that Snufkin is more like a contemporary dancer as Mama and Papa are more like ballroom dancers! Then the visualist Carmela Wager told about the challenges a costume designer faces when she is supposed to make the costumes wearable, dansable and yet autenthic looking. As part of the whole project there is also an educational branch. 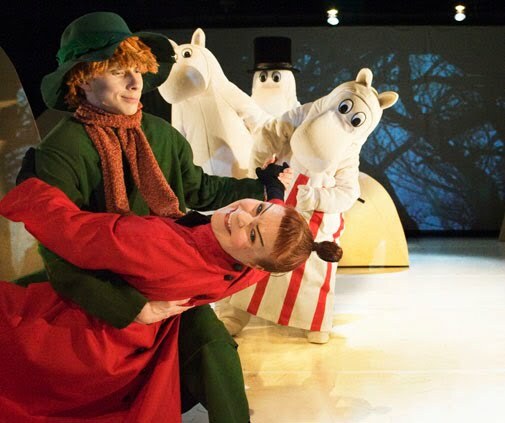 Some elementary school pupils from Rahola school in Tampere attended a workshop where they had the opportunity to experience the dance of the moomins themselves. They also saw the dance piece and attended the art exhibition in the Moominvalley of Tampere Art Museum. After he workshop they draw ‘Happy birthday’ cards for Moomin and the cards were presented in the symposium side by side with Tove’s original art. Today the weather is a lot hotter than yesterday, but the forecast also says there might be thunderstorms on the way, so again I’m asking you to keep your fingers crossed for us! Ni hao. Wow. Here we are, in the World EXPO 2010 in Shanghai, China. The EXPO area is huge and crowded and humid and so is the city itself. We arrived on Sunday morning and got to EXPO for a rehearsal. Today we've already opened the digigraphie exhibition of Tove Jansson's art by the Moominvalley of Tampere Art Museum and celebrated the 65th birthday of Moomintroll (which is the same day as the birthday of the late artist, 9th of August). The characters have made appearences inside and outside of Kirnu, the Finnish pavillion in the EXPO. Later today we'll have the first whole performance as the contemporary dance piece Dancing Moominvalley will take over the stage on Europe Square. Wish us luck! The hot and humid weather is very challenging for the dancers, but nevertheless we'll put up a mighty show. We also made the cover of the daily EXPO Events Chedule so we're expecting a good crowd. Heading for the whole day travelling all away to China. That is a lot of miles ahead. Yep. Today we are finally taking off for the Shanghai Expo 2010 performances. Keep reading the Dancing Moominvalley blog. We try to update the happenings in real time. From Shanghai. The Tampere Theatre Festival is getting started this week. Did you know? Also The Great Nocturnal Happening is arriving to town on the 5th of August. So, be aware while walking the Hämeenkatu. You might run into the dancing moomins. That is Thursday. Starting around at 4pm. I suppose it might be Little My leading the whole bunch towards the Moominvalley. What else? There is definitely fantasy in the air. Have you ever heard of the Transcript? "Transcript is a bi-monthly review of books and writing from around Europe. Its aim is to promote quality literature written in the 'smaller' languages and to give wider circulation to material from small-language literary publications through the medium of English, French and German." In Transcript I found an article by Sirke Happonen, 'Pictures that give wings to fantasy: the relationship between illustration and text in Tove Jansson's Moomin books'. "The distinctiveness of the Moomin books is largely due to the marriage text and picture, and the tension between illustration and storyline. " "The collaboration between word and picture achieves Jansson's view of the relationship between illustration and text: the task of illustration is to continue the fantasy, not to restrict it." I keep reading, "(...)the task of illustration is to continue the fantasy, not to restrict it." As is the task of contemporary dance. Dance leaves a great deel for the audiences own fantasy, in both 'misreadings' and 'understanding'. Whatever they may be. "Transcript is published by Literature Across Frontiers, the European programme for literary exchange and policy debate, with the support of the Culture 2000 programme of the European Union. Literature Across Frontiers operates through partnership with a network of literature and translation organisations." So, greetings from Tampere. On our way to Shanghai. About the importance of corresponding. You still remember me finding a review by Leona R. Wisoker? And me writing a letter to this book critic and author of a recently published "Secrets of the Sands"? Leona wrote me back. And she is still having her Moomin books with her. She says: "Yes, I still have my collection of Moomin books; in fact, I've added to the collection since I wrote that review! There is a series of Moomin comic-strip books (graphic novels) by Tove Jansson that I've been collecting as money permits, and I love them as much as I do the text books." Leonas book can be found through http://www.amazon.com, through http://www.bn.com, or your local independant bookstore can order it (Also Leonas recommended option! If we want to support small businesses and independent bookstores). So, I did start her new book. And for what I have read I can warmly recommend it. 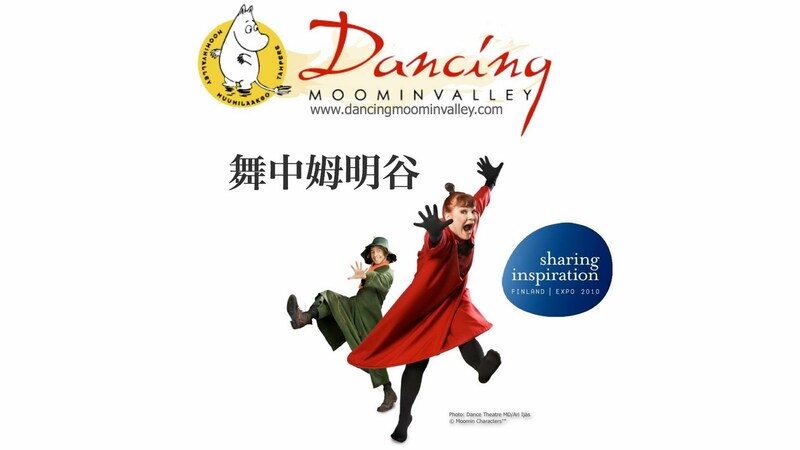 Happy to announce the Dancing Moominvalley Programme at the Expo 2010 in Shanghai. Coming up three shows, concerts, an exhibition, a seminar, plus some getting-together's and artist meetings. Based on Tove Jansson’s book "The Tales from the Moominvalley", The Dancing Moominvalley is a family dance adventure that begins with Snufkin’s search for his missing spring tune. The versatile Dancing Moominvalley ensemble leads the audience into a magical place of searching, learning and life’s little and big wonders. The performance opens Jansson's well known themes: invisibility, otherness and difference. Visually spectacular, fully composed contemporary dance piece for the whole family has a new approach to the moomins but the themes are familiar to all of us who have read the books. 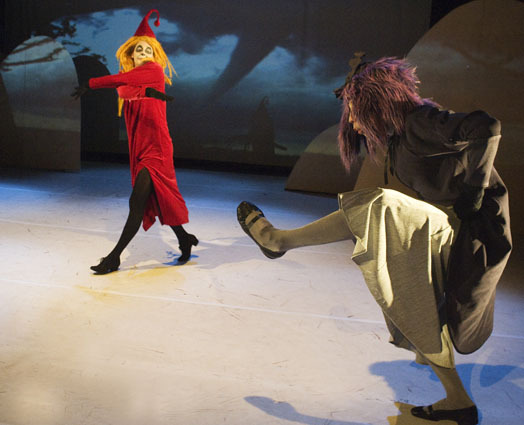 A part of the project ”Dancing Moominvalley Shanghai Expo" is featured in the Finnish cultural program at EXPO 2010 cultural export plan. The piece for the whole family celebrates Moomintroll ́s 65th Anniversary. Composed and created by: Heikki Mäenpää Music and movement inspired by the Art of Tove Jansson. What will happen when Snufkin plays his harmonica and his best friend Moomintroll playes the double bass? That will be seen when Moomin Family and their friends sing and dance with the musicians and the audience. Tarkistin tässä vielä, mitä wikipedia kertoo Shanghaista. "Shanghai (上海, pinyin shànghǎi, shanghainkiinaksi [zaŋhɛ]; vanha suom. latinaistus Šanghai) on Kiinan suurin kaupunki ja yksi sen neljästä maakuntatasolla itsehallinnollisesta kunnasta. Kaupungin kehitys viime vuosikymmeninä on tehnyt siitä yhden tärkeimmistä talouden, kaupan, rahoituksen ja viestinnän keskuksista Kiinassa. Kaupungissa rakennetaan enemmän kuin missään muualla maailmassa. Kaupunki pyrkii kosmopoliittiseksi maailmankaupungiksi houkuttelemalla mm. maahanmuuttajia ja kulttuuria. Kaksi kirjainta sanassa Shanghai tarkoittavat kirjaimellisesti ’ylös/yläpuolella’ ja ’meri’. Tämän nimen varhaisimmat havainnot tehtiin Song-dynastian aikana, jolloin joen luona oli jo kylä nimeltä Shanghai. On epäselvää, mistä nimi tuli ja miten se tulisi tulkita, vaikka kirjallisuus esittää yleensä ajatusta ’meren päälle’. Kiinaksi Shanghai lyhennetään Hù (滬 tai 沪) ja Shēn (申)." Kirjoitin tässä taannoin Scema Magazinen artikkelista, ja lehden tavoitteesta ylläpitää monikulttuurista toimituksellista linjaa. - Siis monikulttuurisuuden. Mikä sitten olisi ero monikulttuurisuuden ja kulttuurien välisyyden(...) niin, ero niiden välillä? Scema Magazinen mukaan ero on siinä, että kun puhutaan kulttuureista ja niissä elävistä ihmisistä, koemmeko me olevamme kulttuurien välissä, siis loppuen lopuksi aina matkalla jonnekin. Välitilassa. Vai olisiko niin että meitä ympäröivät kulttuurit oikeastaan sekoittuvat meissä. Meiksi. Näin ollen voisimme hylätä ajatuksen 'kulttuurien välisyydestä' ja tavoitella 'monikulttuurisuutta'. Kulttuuria meissä. Ei meitä kulttuurien väleissä. Pieni ero tietenkin, mutta näkökulman vaihto on tässä merkittävä. We're not "caught between cultures", but moving through them. We're not hybrids or simply bi-racial. We're more complicated than that. If anything we're "blended". Helsingin Sanomissa taas oli tässä taannoin mielenkiintoinen juttu Svenska Teaternin vetämästä projektista Shanghaissa. Siitä, kuinka me pikkuhiljaa sekoitumme. Kiinalaisviranomaiset vaativat Shanghaissa esitettävän näytelmän tekevän selvän eron hyvän ja pahan välille. Suomalaisohjaaja kieltäytyi vaatimuksista. Toukokuussa Shanghaissa ensi-iltansa saava näytelmä Muumipappa ja meri on herättänyt epäilyksiä Kiinan sensuuriviranomaisissa. Svenska Teaternin ja kiinalaisten näyttelijöiden yhteistyössä Shanghain maailmannäyttelyn oheen tekemä näytelmä on saanut viranomaisilta hyväksynnän, mutta siihen on vaadittu muutoksia. "En ole suostunut muutoksiin", sanoo näytelmän ohjaaja Anneli Mäkelä. Sensuuriviranomaiset ovat arvostelleet sitä, ettei näytelmässä tehdä selvää eroa hyvän ja pahan välille. Tarinassa esiintyvä Mörkökin on omalla tavallaan hellyttävä ja ymmärrettävä. Mäkelän mukaan asioiden muuttaminen selvästi hyväksi tai pahaksi olisi romuttanut kirjailija Tove Janssonin kirjojen maailmankuvan. Mäkelä arvelee näkemyserojen johtuvan maailmankatsomuksellisista eroista: Kiinassa yksilö on alistettu uhrautumaan yhteisön edestä, kun taas näytelmässä individualistinen Muumipappa lähtee etsimään itseään ja elämänsä tarkoitusta saarelta. "En yhtään epäile sitä, että kiinalaisten on vaikea tajuta tällaista suomenruotsalaista hippelishii-maailmankatsomusta." Kiinalainen teatterinjohtaja Xia Xiaoxue ymmärtää sensuuriviranomaisia. Kulttuurierot Suomen ja Kiinan välillä ovat suuret. "Kiinalaisen opetusperinteen mukaan vanhemmat ja opettajat kertovat lapsille, mikä on hyvää ja mikä pahaa. Näytelmässä hahmoilla on kuitenkin omat luonteensa, eivätkä he ole kaikki selvästi hyviä tai pahoja", Xia ihmettelee. Pikku Myytä esittävä näyttelijä Zhang Jing selittää kiinalaisten vaikeuksia ymmärtää muuminäytelmää sillä, että kiinalaiset näytelmät ovat yksinkertaisempia ja tarinat ennalta-arvattavampia. "Ei se ole kuitenkaan niin paha, vaikka kiinalaiset eivät tätä ymmärtäisi. Heille voi näytelmän jälkeen herätä kysymyksiä, ja se on myös tärkeää." "Ei se ole kuitenkaan niin paha, vaikka kiinalaiset eivät tätä ymmärtäisi(...)"
Niinpä. Entä, jos ymmärtämisen sijaan herääkin toive ja pyrkimys ymmärtämiseen? Ja kysymiseen. Itseltään kysymiseen. Ja miksei aloittaisi vaikeimmasta: Mikä on hyvää, ja mikä pahaa? Ja jatkaisi siitä kysymykseen: Mitä minä olen? Entä mitä mahtaisi Muumipappa tehdä, jos hän eksyisi nyt Kiinaan. "Tuskin hän ajattelisi suuria sosiaalisia muutoksia, vaan yrittäisi ehkä tehdä jotain pientä hyvää omantuntonsa helpottamiseksi. Muumimamma sen sijaan varmaankin perustaisi jonkin köyhien avustusjärjestön", Mäkelä sanoo. Ajattelemisen aihetta, monikulttuurisuudesta, ja kulttuurien välisyydestä, myös niiden välitiloista. How to inform people about a happening, which is as large and multidimensional as the EXPO World Exhibition? That is a good question. Well, you could start by checking the Sharing Inspiration blog. Sharing Inspiration blog, echoing the name of the Finnish Expo theme, shares the highlights of the cultural program in Shanghai. The blog informs about upcoming cultural events and reports from Shanghai through texts, pictures and videos. "Finland Day on the 27th May presents Finnish culture with more than a hundred artists performing in four different venues of the Expo area. The Finnish National Ballet will perform at the Music Club venue of the Expo Performance Center, with performances of Finnish folk music, jazz, circus arts and dance." And let's have a Great Summer wherever we are. 8 more weeks before Dancing Moominvalley takes a flight for Shanghai. Some of this following may sound a bit, well, Dutch, so don't hesitate to ask for the translation. You find it, I believe. At the Radio86. Heel Goede Middag iedereen die ook een beetje Nederlands kan lesen. Gisteren heb ik iets heel leuks en besonderes gefonden. Namelijk en interview van Heikki Mäenpää, die eigenlijk in Nederlands vertaald was. Het is geen geheim dat China tientallen miljoenen bezoekers verwacht voor de wereldtentoonstelling in Shanghai. Wat wel een geheim is, is dat de bezoekers van het Finse paviljoen de kans hebben om een optreden met de naam 'Dancing Moominvalley' te aanschouwen. Een dansproductie gebaseerd op Tove Jansson's boek 'The Tales from the Moominvalley'. De choreografie is in handen van Samuli Roininen en de muziek is gecomponeerd door Heikki Mäenpää. Radio86 sprak met hem. Volgens Tove Jansson zijn de Moomin boeken fantasie verhalen voor kinderen. Maar Heikki geloofd dat de Moomin shows op zowel kinderen als volwassen zijn gericht. He explains how the moomins manage to touch both the adults and the children. Wat else. Dat dit alles heel spannend is. Ympäristöt näyttävät niin erilaisilta, kun näkökulmaa, tai valoa hieman käännnetään. Blue screenin rullattuna, tarpeettomana pois rullattuna. Piilossa. Tietenkin ihan normaalia. Tällainen purku. Merkki siitä, että aika kuluu. Asiat etenevät. Silti kuitenkin jotenkin, enpä tiedä, surullistako sitten? Vaiko osoitus siitä että se ????? Että jotain uutta alkaa muodostua tilalle. Schema Magazine. Sanooko mitään? Heard of it? Kyseessä on kanadalainen verkkojulkaisu, joka näkee itsensä uuden globaalin valtavirtakulttuurin ilmiöiden esiintuojana, eräänlaisena kulttuurinavigaattorina, jonka johtoajatuksena on monikulttuurisuuden vahvistaminen. "Like you, we belong to no one tribe. You're naan, adobo and bubble tea. You are comfortable in your skin and comfortable with other skins marching to the beats of their own drums. Or tablas. Or djembes. Constantly moving, your life is about bursting through ceilings and taking diversity with you." "Over the past six years we've tried really hard to describe what Schema Magazine is all about. We've used various descriptions—even had to create new terms like ethnic cool. To be honest, we've never been satisfied. The thing is, the identity we are trying to express, is new. We know intuitively what we mean, but we don't yet have the popular language or the concepts to really describe it. In fact, that's why Schema Magazine is so necessary: we've been stuck using 1970's language and ideas to talk about our fluid and complexly multi-ethnic, multi-cultural and sometimes transnational identities. We're not "caught between cultures", but moving through them. We're not hybrids or simply bi-racial. We're more complicated than that. If anything we're "blended." So here's another attempt. Schema Magazine is a blend of pop-culture and identity, from the perspective of being 1.5-, 2nd-generation and beyond." "In 1945, in the midst of World War II, Swedish-speaking minority Tove Jansson, of Finland began to write and illustrate the cheerful Moomin Valley series. The story features white trolls (in actuality, they're hippopotamuses) that reside in a beautiful Finnish forest." Hän jatkaa ja kertoo venäläisestä interiöörisuunnittelijasta, Maria Yaskosta, joka on suunnitellut Muumilaaksosta inspriroituneen huoneen. - Mielestäni aika kitschin tosin(...)hallitusti sitä tietenkin. "(...)created by Russian interior designer, Maria Yasko who felt the desire to honour and depict the whimsical fantasies of a wonderful Finnish artist/writer named Tove Jansson. But Yasko wasn't the first to honour the Moomin Valley tales." "What else? Her (Tove Jansson) book has been adapted into television and film and has even inspired a museum known as The Moominvalley of the Tampere Art Museum. The Moomin characters were placed on airplanes: Finnair MD-11, a Russian rock group named themselves after them: Mumiy Troll, and to put the cherry on top of a long list, Moomin has its own Moomin World. That's right, it's an entire island- it's a WORLD!" "If anything we're "blended." - Vaikuttavaa. One thing, though(...) Moomins are NOT, I repeat, they're NOT any hippopotamuses. Tickets: adults 15 euros, children under 15 years 8 euros, group ticket (10 tickets or more) à 8 euros, family ticket (five tickets) 50 euros. Tickets also available via Piletti. Meneillään tämän kevään viimeiset Tanssivat Muumilaaksot. Sitä alkaa miettimään, mitä olemme tehneet. "Hyvä, että alkaa, sillä jos ei mieti, tekee vain sitä, mitä odotetaan tehtävän. Ei oikeastaan näe itsensä ja muiden välistä eroa. Ei näe olevansa vapaa yksilö. On kuka-tahansa. Ja on ei-kukaan." Olla Ei-kukaan. Niinkuin Ötökkä Kevätlaulun alussa? Olla keskeneräinen, nimeämätön. Ja sitten tulla omaksi itsekseen. Niin alkoi leikki ja työ, ja se näyttäytyi mielekkäänä ja merkityksellisenä. Se toi mukaan tunteet, ajattelun ja muistin. Kaikki merkittäviä, silloin kun jakaa tilaa toisen kanssa. Ötökälle ja Nuuskamuikkuselle leikki on sosiaalinen tapahtuma. Tanssin tavoin puhuttu tai kirjoitettu kieli on ajattelun työkalu. Tämänhän me tiesimme. Sanotaan, että leikki ja kieli ovat yhteydessä mielikuvitukseemme, joka mahdollistaa abstraktin ajattelun. Leikki mahdollistaa yhdessä olemisen ja kokemisen. Kieli taas on työkalu yhteiseen pohdintaan, kysymyksille ja ääneen pohdintaan. Tanssivan Muumilaakson yleisössä se näkyy mukana tanssivissa ja ääneen tilanteita ja omia tuntemuksiaan kommentoivissa lapsissa. Aikuinenhan ei näin enää kerran opittuaan reagoi. Onko tanssi yhdenlaista leikkiä? Onko tanssi tanssivan ihmisen tapa tulla omaksi itsekseen? Olemmeko? Saaneet näyttämöllä omat kasvomme? - Välin tuntuu, että olemme. Ja toisinaan tuntuu siltä, että olisimme voineet mennä vielä pidemmälle. Päästää hahmot irti. Kirjaimellisesti. Olisimme voineet vastata siihen kysymykseen, miltä tuntuu käydä Muumilaaksossa, ja sitten tipahtaa sieltä pois. Laajarinne jatkaa Ti-ti-uusta, ja leikin ideasta. Idean merkityksellisyydestä. Siitä, kuinka tärkeää on tajuta, mihin ryhtyy, tajuta leikin idea. Tajuta se itse. "Vain kuolleet kalat uivat myötävirtaan, kuten sanonta kuuluu. Tällä ei tietenkään tarkoiteta aktiivista uimista vaan ajelehtimista. Myös epäaidosti ajatteleva ihminen ajelehtii. Hän ei todella elä, kuten Ti-ti-uu kuvasi vanhaa olemistapaansa, ja siksi häntä voidaan verrata kuolleeseen kalaan. Hän antaa myöten ulkoisille voimille ja muuttuu niiden osaksi. Hän uskoo olevansa surkea rääpäle, jos sarkastinen täti antaa niin ymmärtää. Hän leikkii ymmärtämättä leikin ideaa, koska toiset pyytävät häntä leikkimään." Kiitokset vaan kaikille tämän viikon Tanssivan Muumilaakson esityksissä ja Museoiden yössä mukana olleille. Myös radioaalloilla ollaan kuultu kaikenlaista. "Kerromme Kansainvälisen Tanssin päivän gaalasta Martinus-salissa Vantaalla 24.4. ja tamperelaisen Tanssiteatteri MD:n Tanssiva Muumilaakso-esityksestä (Tikkurilan lukion auditoriossa 28.4. klo 10.00, koreografia Samuli Roininen ja musiikki Heikki Mäenpää) sekä Jukka Laajarinteen kirjasta Muumit ja olemisen arvoitus." "Kulttuuri A & T on taiteen ja kulttuurin ajankohtaisohjelma. Lähiradiossa vuodesta 2003 torstaisin klo 13 ja uusinnat lauantaisin klo 16. Anja Lanérin ja Tapani Sihvolan toimittamassa Kulttuuri A & T ohjelmassa paneudutaan kulloiseenkin teemaan puoleksi tunniksi kerrallaan. Aiheina ovat pääkaupunkiseudulla ja muualla Suomessa ajankohtaiset kulttuuritapahtumat, teatterin, musiikin, elokuvan, oopperan, tanssin, kuvataiteen ja kirjallisuuden alueelta." About the Night of the Museums. "The Night of the Museums takes place on May 15th in Tampere, with several museums being open from 6 pm to 12 am. In addition to the beautiful exhibitions, the museums and galleries taking part in the Night of the Museums also offer various kinds of special events for their visitors. The Tampere Night of the Museums is part of a European series of events." Special chance to meet also Snuffkin and Little Myy. See You there. In the Moominvalley. "The Moominvalley of the Tampere Art Museum is a museum devoted to original works by writer and artist Tove Jansson. Its unique collections comprise around 2,000 works. The museum is based on the Moomin books by Tove Jansson. So far, they have been translated into nearly 40 languages. The books fascinate adults and children alike. The original Moomin illustrations by Tove Jansson are an essential part of the atmosphere of the museum, and the three-dimensional tableaux built by Tuulikki Pietilä add to our own picture of the goings-on in the Moomin stories. The gem of the collection is a blue five-storey Moomin House that is as exceptional as its residents, and its builders, Tuulikki Pietilä, Pentti Eistola and Tove Jansson." Museoiden yö siis lähestyy. Sen kunniaksi julkaisemme tässä Tanssivan Muumilaakson uuden trailerin. Kurkatkaa. Ja tervetuloa Hällään: Esitykset jatkuvat aina toukokuun 19. päivään saakka. "Museoiden yö saapuu kaupunkiin tänä lauantaina klo 18-24! Yön lippuja voi ostaa jo ennakkoon tapahtumaan osallistuvista museoista ja Galleria Himmelblausta, samaan edulliseen hintaan 5e / henkilö ja 12e ryhmä / enintään 5 henkeä. Museoiden yön nettisivuille http://www.tampere.fi/museoidenyo on päivitetty viimeisimmät tiedot mm. ohjelmasta, museobussin liikkeistä ja aukioloajoista, joten sieltä käsin on hyvä suunnitella omaa Museoiden yö -kierrosta. Lasten ja lapsiperheiden kannattaa ensimmäiseksi suunnata Muumilaaksoon, jossa on jaossa ilmapalloja nopeimmille ja mm. kurkistuksia Tanssiteatteri MD:n Tanssivaan muumilaaksoon klo 19. Tunnelmallinen museobussi kuljettaa Museoiden yön vieraita klo 23 asti eri museoiden välillä, joten tapahtumapaikalta toiseen siirtyminen on todella vaivatonta. Myös Tallipiha on auki Museoiden yössä klo 22 asti, samoin kuin Näsilinna ja Vapriikki. "Moomin Valley is a quiet, peaceful place somewhere in Finland. It was first discovered by Tove Janson in 1945. In Moomin Valley, eggshells turn into clouds and the rivers are (periodically) full of Rasberry Juice. In Moomin Valley, giant snow horses come to life and the Queen of the Cold rides accross the sky on winters nights... while in Moomin house, Moomin Mama, Moomin Papa, and Moomintroll himself keep an open house for all their friends..... "
You might find this information after googling the Dancing Moominvalley and BBC. "Welcome to h2g2! This tour looks at different parts of the site and includes advice on how you can get involved. The tour has seven parts including this one - you can use the links bar above to find your way through them. We'll kick off with the answer to the most important question of all: What is h2g2? h2g2 stands for 'The Hitchhiker's Guide to the Galaxy' - an unconventional guide to Life, The Universe and Everything. This site - the Earth Edition of the Guide - is an encyclopaedic project contributed to by people from all over the world. h2g2.com was launched in April 1999, and the BBC took over the running of the site in February 2001 as part of a drive to develop new and innovative online services. Anyone can write for the Guide, which already has thousands of entries on all sorts of subjects. Meaningful collaboration is encouraged and users help one another, feeding back on what others have written using a peer review system. The result is a living, breathing guide that's constantly being updated and revised, driven forward by the very people who use it. h2g2's inspiration comes from The Hitchhiker's Guide to the Galaxy, the best-selling book by Douglas Adams, one of the original founders of the site. Back in 1971, Douglas lay drunk in a field in Innsbruck, Austria, thinking about the galaxy and how you might find your way around it. His solution, the 'Guide', was an ingenious device that offered advice about almost any place, object, entity or event you might care to name - all at the convenience of your fingertips. This vision is now approaching reality, both on the Internet and on mobile phones, in the form of h2g2." Thank you BBC. That explained it all. Me myself got very amused by this presentation of TooTicky. 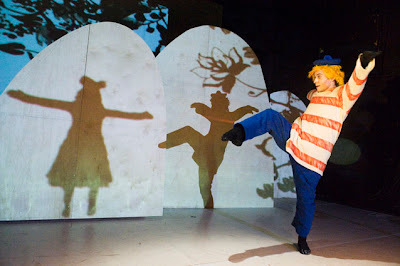 TooTicky beeing actually one the characters I performe in Dancing Moominvalley. "TooTicky Is a remarkably self sufficient little girl with a large stripey jumper, a weight problem, and a predeliction for living in MoominPapas bathhouse and eating fish. She is quite fey and spends her time building snow horses for the Lady of the Cold and making fish soup." Lovely. - To have a guide to Life, The Universe and Everything. Trustworthy. Yet unconventional. Tanssivaa Muumilaaksoa esitetään Hällässä toukokuussa vielä 11 kertaa, ajalla 10.5. - 19.5. Wilson kirjoitti havainnoistaan siitä, kuinka Toven tuotannossa ns. aikuisille kirjoitetut teokset heijastelevat Toven 'muumituotannon' henkilöitä ja tapahtumia. Totta tietenkin. Esimerkiksi Anna ja Katri muistuttavat kovasti Vilijonkkaa ja Kampsua. Entäs sitten? Tovelle itselleen leimaantuminen lastenkirjailijaksi, ja edelleen muumikirjailijaksi oli ongelmallinen. Boel Westin kertoo kirjoittamassaan Toven elämänkerrassa, kuinka vuonna 1961, samaan aikaan kun Tove kirjoitti Näkymätön lapsi ja muita kertomuksia novellikokoelmaa, julkaistiin Toven puheenvuoroihin pohjaava essee "Luihu lastenkirjailija" (Horizon, 1961). Siinä Tove kuvailee teoriaansa lasten "arkipäivän jännityksen ja mielikuvituksen turvallisuuden" välisestä tasapainosta. "Kirjoittamisen edellytyksinä ovat kirjailijan oma halu ja tarve, eivät siis lapset lukijoina. Tove seuraa teoreettista periaatetta aikuisille kirjoittamissaan novelleissa ja romaaneissa. Niissä ei olla "kilttejä toisille", mikä huolestutti arvostelijoita. Vakuuttavien lastenkirjojen tapaan mukana on myös vaarallisen merkityksellinen pohjavire." "Vaarallisen merkityksellinen pohjavire(..)" - Aikalaiskriitikoilla oli siis kädet täynnä tekemistä, kun piti ymmärtää Toven sukkulointia aikuisten- ja lastenkirjallisuuden välillä. Monet kriitikot myös nostivat lopulta kädet korkealle ilmaan ja myönsivät oman kömpelyytensä. Myöhempi Toven tuotannon luenta, ja ymmärtäminen on tehnyt selväksi että Tove oli ensisijaisesti kirjailija, etuliitteillä tai ilman. - Tovessa nousi myös tarve tulla ymmärretyksi kuvataiteilijana. Myös Suomen Ulkoasiainministeriön viime vuoden marraskuun kulttuurikatsauksessa löytyi kommentti uudesta käännöksestä. "Britannia on käännetylle kaunokirjallisuudelle poikkeuksellisen haastava markkina-alue, mikä tosiasia pätee myös suomalaiseen käännöskirjallisuuteen. Sääntö edellyttää kuitenkin poikkeuksensa: marraskuussa Britanniassa julkaistu suomalaistaiteilija Tove Janssonin teos The True Deceiver, alkuperäisnimeltään Den ärliga bedragaren (1982), keräsi laajalti huomiota paikallisten tiedotusvälineiden kulttuuripalstoilla. "Metro-lehti nostaa omassa arvostelussaan (Jansson proves to be The True Deceiver, 26.11.) esiin tämän tummasävytteisen tarinan viittaukset Janssonin omaan persoonaan, joista ilmeisin on toisen päähenkilön toimenkuva lastenkirjailijana. Samaa seikkaa alleviivaa myös Independent omassa arviossaan (The True Deceiver, By Tove Jansson, 6.11.). Tarina ei kuitenkaan jää pelkäksi Janssonin oman egon tutkiskeluksi: Sunday Telegraph (Paperbacks, 1.11.) kuvaa tämän yksinkertaista mutta hienovaraista kerrontatapaa hyväksikäyttävän kirjan koskettelevan myös ihmisluonnon ja taiteen keskeisiä kysymyksiä. Guardian-lehden kirjallisuustoimittaja Ali Smith toteaa pitkällisessä analyysissään (A winter’s tale, 7.11.) The True Deceiverin olevan yksi Janssonin parhaista aikuisromaaneista, joka keskustelee taiteilijan luomisvoiman salaperäisistä lähteistä sekä tämän suhteesta ympäröivään luontoon. Kirjan vetovoima ei Smithin mukaan perustu muumimaisen keveään viehättävyyteen, vaan elämän karujen puolien, kuten petollisuuden ja häikäilemättömyyden, kaunistelemattomaan esittämiseen."